DUNE DUSTUP: After years of unfruitful squabbling over regulation of the OHV riding area of the Oceano Dunes, stakeholders on different sides of the issue are moving toward change with a lawsuit and dust control measures. Sand dunes are complicated, unstable, constantly shifting, and abrasive—a delight to some, and a nuisance to others. Fittingly, all of those adjectives are equally suitable for describing the years-long dispute over the regulation of the Oceano Dunes State Vehicular Recreation Area (ODSVRA). At the heart of the debate is a coarse, airborne dust called PM10 (particulate matter with a mean aerodynamic diameter of 10 microns or less). Studies have shown that levels of PM10 on the Nipomo Mesa, a residential area downwind of the ODSVRA, are dangerously high, with the potential to adversely affect the health of residents. While no one disputes the high levels of PM10, there’s tremendous disagreement about the source of the air pollution. After numerous studies, lawsuits, and highly public tiffs, stakeholders across the spectrum have, essentially, fought to an impasse. In the past few weeks, however, an aggressive lawsuit from a group of concerned Mesa residents and emergency dust control measures approved for implementation by California State Parks have busted through the status quo, from opposite ends of the spectrum. Though air quality advocates feel that the State Parks measures aren’t good enough, and OHV advocates feel that the lawsuit will be unsuccessful, both are steps in the direction of change. “Controlling dust from the [ODSVRA] should just be a simple, regulatory matter, but it’s turned into an ugly political, litigious mess,” said San Luis Obispo County 3rd District Supervisor Adam Hill. The matter of mitigating (or not mitigating) dust in the dunes has involved several key stakeholders: SLO County government (both the Board of Supervisors and the county Air Pollution Control District [APCD]), State Parks, citizens living on the Nipomo Mesa, and off-highway vehicle (OHV) advocates like the Friends of Oceano Dunes and Kevin P. Rice. According to Arlene Versaw, co-founder of the Mesa Community Alliance, a nonprofit activist group dedicated to “represent [the] common interests” of Mesa residents, the dust issue is very simple. “There is a serious air quality problem here on the Mesa, the preponderance of evidence shows that the OHV area is a major cause of that problem, and we need to address the significant health threat,” Versaw told New Times. After growing frustrated with the unresponsiveness of State Parks and the county regarding the air quality issue, the Mesa Community Alliance filed suit against those two bodies on Feb. 27 in SLO Superior Court. Though some have taken this lawsuit as evidence that the Mesa Community Alliance, Hill, and APCD Executive Director Larry Allen ultimately want to close down the ODSVRA, all three stakeholders vehemently denied that accusation. Hill, Allen, and Versaw said they’re all working in their separate arenas to ensure action on the air pollution issue as soon as possible. On the other side of the issue, OHV activist Kevin P. Rice said he has manifold doubts and concerns about the dust control efforts. Rice questions the tactics of the APCD and the Mesa Community Alliance at almost every turn. He claims that the science establishing OHV activity as a major air polluter is shoddy, says the APCD has ignored other viable causes of air pollution (local construction, deforestation, and ocean-borne PM10 among them), and maintains that both organizations have cherry-picked facts and arguments that support what he says is their ultimate goal: closure of the ODSVRA. While disagreements between OHV advocates like Rice and environmentally focused organizations like the APCD and Mesa Community Alliance are well worn and seemingly intractable by this point, State Parks is focused on recently approved emergency dust-control measures to move toward change in the dunes. 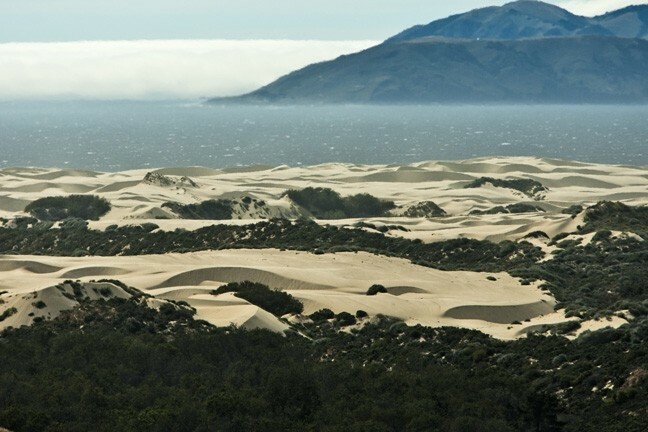 According to Oceano Dunes District Superintendent Brent Marshall, his district was able to secure an emergency permit from the Coastal Commission in mid-March that will allow for the installation of wind fencing and hay bales in the dunes to cut down on PM10 pollution. Marshall said that, starting March 17, workers will be installing 30 acres of hay bales in a grid and also erecting several long lines of 4-foot-high, meshed plastic wind fencing. Both measures are designed to slow down and disrupt winds traveling on the surface of the dunes, and newly installed air monitors will assess the success of these efforts. Though Marshall said he hopes for a significant PM10 pollution reduction, Versaw and Allen said that State Parks’ dust control measures—which are only permitted through the end of June—are merely a good first step, and don’t go nearly far enough to adequately control dust and protect Mesa residents. As State Parks’ dust control measures and the Mesa Community Alliance lawsuit both press for change, the looming deadline for all stakeholders is May 31, 2015. At that date, the APCD’s controversial “dust rule”—enacted in November 2011 and upheld in court after challenges from Rice, Friends of Oceano Dunes, and State Parks—will go into full effect. If PM10 levels on the Mesa still exceed state standards at that point, the dust rule, according to Allen, gives the APCD the ability to penalize State Parks using a “toolbox” of penalties, ranging from discussions to re-evaluations to costly fines of up to $1,000 per day. For now, mediation is ongoing between all the stakeholders—both in courtrooms and boardrooms—as it has been since 2010, when studies first identified the Mesa’s air quality problem.